For topical application, external use only. Apply AllicinMAX™ cream by massaging gently into the skin in the affected area. 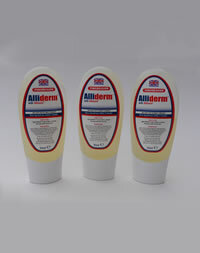 AllicinMAX™ cream contains Allisure® liquid- active natural ingredient. Ingredients: Aqua, Brassica oleifera (rapeseed oil), Allicin liquid, Glyceryl streate, Glycerin, Stearic acid, Xanthan gum, Tritcum vulgare (wheatgerm oil), Honeysuckle extract, Tocopheryl acetate, Allantoin, Retinyl palmitate, Sodium Hydroxide, Phenoxyethanol, Benzoic acid, Dehydroacetic acid, Ethylhexyl glycerine, Polyaminopropyl biguanide. Advisory Information: If you are allergic, intolerant, or hypersensitive to garlic do not use Allicinmax™ cream. I received a sample of AlliMed Capsules and I have found this product to be quite amazing. My son had a very bad infection with huge swollen glands. I rubbed the AlliMed cream on them and within 24 hours the swelling was down and he felt better and within 48 hrs, it was like night & day. I'm now going to use it on my mother who has a staph infection in her body which has attacked a prosthetic knee implant, I'm so excited to give her this and Allicinmax capsules at the same time and I will follow up with the outcome here soon.